Clean, spacious, and just fine. The kids really enjoyed the indoor pool and hot tub. Would stay there again on another hunting trip. Yes there are feedlots nearby, the entire town of Lamar can smell it regardless where you stay if the wind blows right. This was my second stay at the Cow Palace, although I was expecting to have a room in the interior of the hotel I enjoyed my room with the external entrance just as well I did on my first stay. I just want to commend the staff for the extra services I received and their overall politeness. Everyone from the desk staff to Saloon staff, and especially the manager Vbanda (I believe). I will be back for sure whenever I’m in the area. A group of us from throughout the State of Colorado descended upon Lamar for a 3 day meeting. Due to our need for meeting space we were booked at the Cow Palace and after reading some Trip Advisor reviews my expectations were very low. Upon arrival I checked out my room prior to accepting, and found it newly remodeled with paint, fixtures and a new bed which turned out to be one of the most comfortable beds I’ve ever slept in. The check in person was friendly and accommodating. That’s when my expectations started changing. Along with the good accommodations, we had several meals at the Cow Palace restaurant and again I wasn’t expecting much. How wrong I was. The cheese burger on Ciabatta bread was delicious. The steak was melt-in-your mouth and even breakfast was over the top with a great green chili. My colleagues talked at length about how good the food was, and when we had the opportunity to go to a different restaurant for lunch the gang decided to stay put at the Cow Palace restaurant. Also, the staff we dealt with for our meeting space were friendly and very helpful – always asking if we needed anything and offering suggestions for meeting set-up, breaks and snacks. When we had a small mishap with a leaking water jug, the staff were quick to rectify the situation and had a replacement within minutes averting a big mess. I highly recommend the Cow Palace Inn as a great place to rest with wonderful food and friendly staff. The current owner has put a lot of effort into upgrades and enhancements that will most likely leave the new visitor, like me, pleasantly surprised! After reading some of the reviews, we were a little reluctant to stay at the Cow Palace Inn. However, seeing that all of the beds were new, we thought we would go ahead and give it a try. We’re glad we did! When I first sat down on the bed, I though on no, this isn’t good, but laying down it was WONDERFUL! My husband and I both had a very good night’s sleep – not often done when we stay at motels. The room was spacious and had a microwave, fridge, and iron. There’s only a couple reason we didn’t give 5 stars. The first was that the water pressure was a little low in the shower and the drain was a little slow. The second was that there was only one caf and one decaf coffee packet (each was just for one person) and when my husband went to the front desk, they only had one caf packet left. Picky? Maybe, but it’s something thats easily remedied, and lots of people like coffee first thing in the morning. Evenso, we would definitely stay here the next time we’re overnighting in Lamar. I had read negative reviews about this hotel so I was not expecting much but I hosted my mothers 75th Birthday party here and invited 43 people. The space was gorgeous, the rooms were clean and beds were comfy and the food was very good and I’m pretty picky! Don’t believe the negative reviews, find out for yourself! Poised at the edge of town, the Cow Palace Inn/Rodeway Inn has enjoyed an extensive restoration. Rooms are clean and spacious. Service is friendly, as it was in the old days. Best of all, the food was excellent! A bit of unique, local color is the beautiful floor of polished marble in the entrance featuring brands. I was not expecting a Rodeway Inn motel (formerly a best western) to be so comfortable and nice, especially in a town like Lamar. I stayed 2 nights on a business trip and I really enjoyed my stay and the look/feel of the motel. The rooms are up to date (flat screen tv’s and super comfy beds/pillows), and the lobby and atrium (houses the pool/tub and breakfast areas) were really inviting and clean. Breakfast was good, they had a couple hot food options along with the usual cereal and breads. Will definitely be coming back here to stay again. This motel also has a restaurant (didn’t eat there) and a bar (good service). We really weren’t expecting a lot, but did we get a pleasant surprise. We found the Cow Palace Inn to be something of jewel. We found that the new ownership has really made lots of changes that have brought the property up to the level of class and comfort one would expect in “big city” hotels. For this we will be forever grateful. The rooms were excellent. They were wonderfully decorated and comfortable to the eye as well as the body. The atmosphere drew you to lounge around the room and simply enjoy the stay. We didn’t find ourselves having to invent excuses to get out of the room. We just enjoyed the ourselves and our stay. The food also was excellent. From the dinner menu to the breakfast menu, the selection was wide and the variety had something to satisfy even the most difficult palates. The steaks were cooked to perfection and you got what you ordered–you want medium rare, then you got medium rare. No one was in a hurry to leave the dining room for fear of having a meal they wouldn’t enjoy. In summary, if you are going through Lamar, Colorado, do yourself a favor. 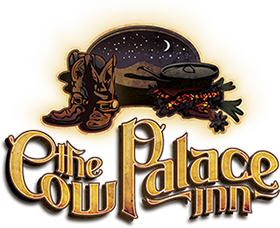 Stop and stay at the Cow Palace Inn. You won’t be sorry! Our family enjoyed the stay. The service was first rate, the updated rooms and facilities were very warm and comfortable…and the restaurant was enjoyed by all which is sometimes not easy to do with our family. I would highly recommend this hotel. I have been to this hotel twice and after the first visit did not even hesitate to stay another night. After 10 days in hotels on this most recent trip it is nice to be in a spacious room with a bed that is comfortable not like a picnic table and pillows that are actually full sized. Good Value and comfortable place to say.